FAQ Part 1 – How High Can I Build My Pallet Flow Rack? So we thought we’d take the opportunity to offer our advice on these topics in a two part FAQ Series. They are seemingly simple questions, which are probably why everyone asks them, but the real answers are usually a little more complicated. 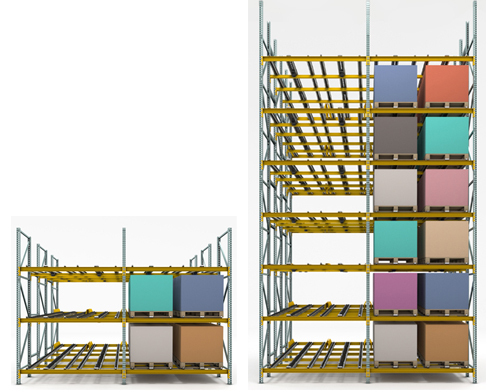 While there is no one-size-fits-all answer for how high the pallet flow rack can go, let’s look at the major variables that we take into consideration when designing a racking system for pallet flow. Building Parameters – To determine the optimal height, and therefore levels of the system, we start with the building itself. The ceiling height, building specs, including obstructions (light fixtures, sprinkler system, ventilation), and fire code regulations are all considered in the design engineering. Load & System Variables – The next step is to look at the load and system variables. Using your largest load, identify the depth, width and height. To further define the height, now add 6” to include your pallet and another 6” for “lift-off” (the amount of space needed for forklift outriggers to insert and extract pallet). This will give you the level height. Now comes the challenge that makes pallet flow more unique vs. standard pallet rack – we still have to determine the pitch. The pitch will define the rear beam elevation. There’s no rule of thumb regarding pitch as many variables come together to define Mallard’s recommendation. Load Weight – There’s one more critical variable that has impact on pallet flow rack system specs and that’s pallet load weight. It has direct bearing on track selection, pitch, controllers and overall system capacity. The typical beam can hold about 3000 lbs. per pallet and most often beams are two pallets wide allowing for about 6000 lbs. per level. It may seem counterintuitive, but because the beams act as upright supports, the tighter the beam spacing, the denser the design and stronger the rack bay. So a 6 level high rack structure with 5 beams is going to be stronger though it is supporting more overall weight, than a 5 level high rack with 4 beams even if they are the same height. Once we have determined our load height, load weight, pitch and how the system will be designed to fit into the building space… we can start stacking! Add each level on to the next to determine maximum allowable system height. We hope this provides an inside look as to how we determine pallet flow rack height. Let us know your specs and we’ll help you design your next gravity flow storage project.